On June 25, Just Harvest joined Pittsburghers for Public Transit, Mon Valley Initiative, public officials, and community stakeholders in announcing the Riders’ Vision for Public Transit in Allegheny County. 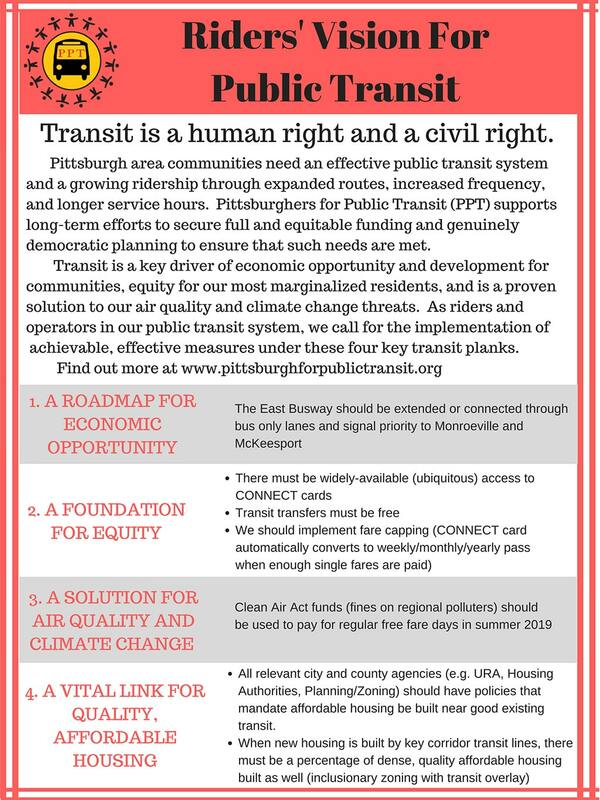 We had helped Port Authority bus riders develop this statement of principles and goals for a transit system that would truly benefit the region and all its residents. Last year, Just Harvest started working with these groups and individuals to prevent the county’s proposed Bus Rapid Transit plan from cutting the Mon Valley’s 61 and 71 buses by nearly 50% and requiring mandatory transfers for those riders to go downtown. Together, we won. Just Harvest’s work will now focus on supporting the equity plank of the riders vision and other aspects of the proposals that clearly address the systemic root causes of hunger and poverty throughout Allegheny County. Accessible public transit is key to helping people in poverty in Allegheny County attain self-sufficiency, as two recent studies by the Urban Institute and the Allegheny County Department of Human Services has found. Helping them access affordable sources of fresh food is also key to addressing food insecurity. Consider the Mon Valley, where an estimated one in seven residents and two-thirds of those living in poverty lack access to supermarkets, according to USDA and Census data. A key obstacle to accessing public transit is cost for the rider. Transportation costs fall heaviest on those most likely to experience poverty, including minorities, persons with disabilities, the chronically ill, the elderly, minorities, and households with children, as well as low-wage workers who often must work two or more jobs in varied geographical locations in order to support the basic needs of themselves and their families. But we also have to keep in mind those who are in “near poverty”. Their income may technically be above the poverty line, but their life expenses — health care, child care, rent — are simply unaffordable. For those households, transportation costs can push them into functional poverty in terms of their ability to pay for their most basic needs. Both officially poor households and many thousands of Allegheny County households that do not fall below the poverty line wind up having to choose between utilities, medicine, food, and bus fare. In part this is because Port Authority of Allegheny County base fares are some of the highest in the country, even though we have lower median incomes than places with comparable fares, like New York City. These high fares limit ridership. They’re also a hugely regressive tax on largely low-income riders, making it hard for them to access their basic needs. There needs to be widely-available access to ConnectCards. 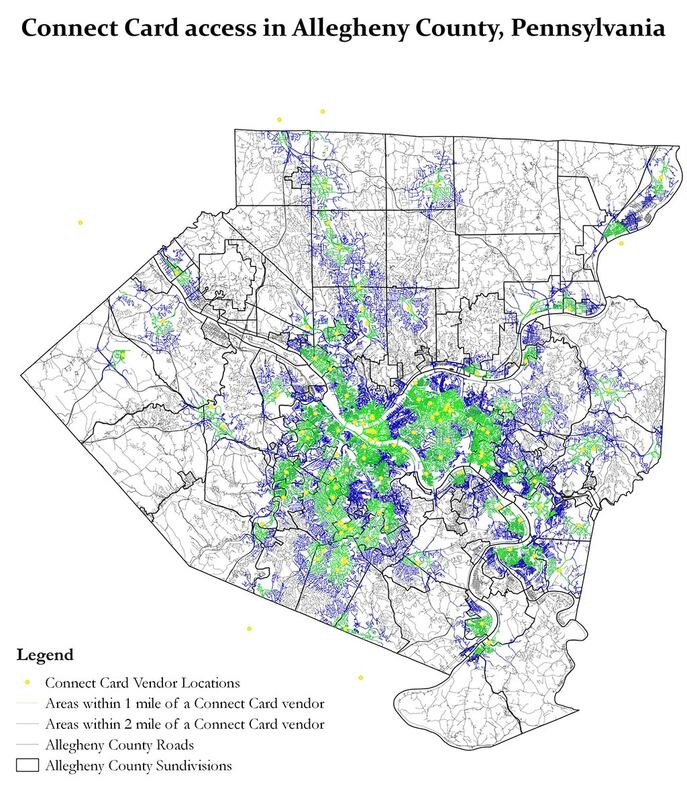 Because many county residents live more than a mile away from the nearest ConnectCard charging infrastructure or vendors, they’re in the catch-22 of having to pay more to get to a location that will help them save money. Those riders wind up stuck without ConnectCards, having to pay higher cash fares. Transfers are also more expensive for these riders. Because Port Authority transit no longer uses paper transfers, riders using cash have to pay the full $2.75 for a transfer versus the $1.00 of the ConnectCard transfer fee. Even if low-income riders are able to afford and charge their ConnectCards, the $1.00 transfer fee is disproportionately costly to people who have to transfer multiple times a day. This happens regularly when people have to work multiple low-paying jobs, go between a job and a job center, go to the grocery store multiple times a week (because they can’t lug all their groceries in one trip), have special health treatment needs, or have children and their various needs. For all these reasons the number of trips climb and the transfer costs rack up very quickly and often unpredictably — because life is unpredictable. And that $1 fee on the ConnectCard is only good for the first transfer. If a rider has to take a third bus to make their connection to a job or other vital need, they have to pay the full $2.75 fare again. It’s an issue of simple fairness. People requiring transfers are likely to be disproportionately transit-dependent and have lower incomes than other riders. It’s also good business. Free transfers grow ridership and encourage people to choose transit over other options. Free transfers increase overall use of the system. Some of the cities that have recognized this and offer free transfers in their public transit systems are NYC, Los Angeles, Houston, Atlanta, Dallas, Denver, Minneapolis, Portland, Washington, DC, San Jose, and Boston. It’s currently being considered by SEPTA in Philadelphia. Even with free transfers and widely accessible ConnectCards, low-income riders who use public transit regularly still face a significant barrier in the overall cost of ridership. They don’t have available cash to pay the full $25 cost up front for a discount weekly pass, let alone $97.50 for a monthly or $1,072.50 for a yearly pass. These riders very carefully plan and ration their transit use for the week, paying by the ride. Any unexpected turn of events – a family member gets sick, they need an extra grocery run – means they have to pay more, and they typically spend more on transit than the discount passes cost. Again, this means they wind up paying more than those with ConnectCards for the same service. A fare-capping system would ensure that our lowest income riders are not paying more for the system simply because they can’t afford a pass. 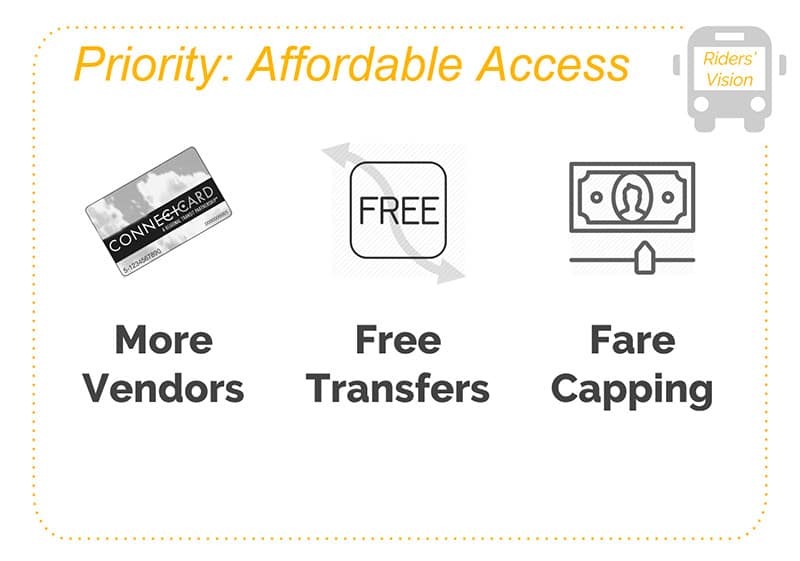 Fare capping would allow riders’ transit spending, once it reaches $25, to automatically turn into a weekly pass. Once they’ve spent $97.50 in a month, their ConnectCard becomes a monthly pass. If they ride less than that they don’t have to spend the full $25 for the pass. These three measures — more ConnectCard vendors, free transfers and fare capping — would send the overall number of rides soaring. This is a win-win for Port Authority, which would benefit because the federal government compensates them per ride. And it would also allow Port Authority to live up to their own equity goals mandated in their service guidelines, by making sure those who need transit the most can access it fully and fairly. Want to be part of this campaign? Contact Helen Gerhardt, our grassroots organizer. food deserts, public transit, public transit equity, Take Action!